"This is a pointless waste of lead. Why don't you just step out here so you can die." Outlaw Justice is a film of startling mediocrity. It is a standard revenge tale that has been seen a million times before, but with better direction, better actors, and certainly, a much better script. This made-for-television movie loosely updates The Magnificent Seven with a cast of country music stars, and may not be the worst western film ever made, but one has to guess that it is hovering right around that area. Tobey (Jennings) is introduced and quickly killed in the opening minutes, in scenes that set the plot into motion. Holden (Gracia) is the killer, a former accomplice who is demanding to know the location of the other members of the group who sent him to prison. They are Lee (Nelson) and Tarence (Kristoferson) who, along with Tobey's son Bryce (Willet), dedicate their lives to finding and exacting their revenge on Holden in order to obtain justice. The plot of Outlaw Justice is so predictable that while viewing it, I found myself making a mental checklist, marking off stereotypes and clichés as they came about. There are barroom fights, crooked law enforcement, train robberies, and even a campfire scene that includes singing and discussion about life. Had the film not resorted to these tired moments, it could have become something more akin to The Wild Bunch than every other western film made for a low budget in the past several decades. The direction is lacking in any sort of energy, so that the gun fights seem overly long and boring without any real sense of tension. At least the vistas are often vast and beautiful, and better to look at than the actors. The performances are, for the most part, lacking in any sort of emotional connection, but this is mostly the fault of the script. Kristofferson and Nelson nicely convey quite a bit of charm that allows the viewer to occasionally look past the problems in the script, but their performances seem as though they belong in a better film. Image Transfer Review: Presented in a full-frame transfer, Outlaw Justice is presented in a transfer that is far from the best the format has to offer. Colors are muted with no vibrancy, while the black levels offer an excessive amount of grain. Edge enhancement is noticeable throughout, most evident in the scenes set indoors. This is a very poor transfer. Audio Transfer Review: The Dolby Surround track is rather uneventful for the most part, with the center speaker garnering much of the activity. Dialogue is occasionally muffled, but the remainder of the time it is crisp enough, with only a few moments of distortion. Extras Review: No extra features have been offered for Outlaw Justice. 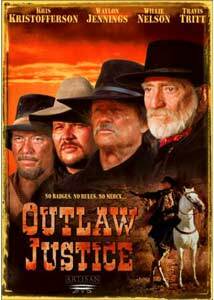 Outlaw Justice is a mess of a film with no real direction or purpose. The performances by a pair of American legends are worthy of note, but that's about it.